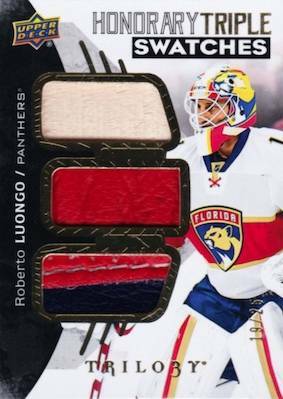 2017-18 Upper Deck Trilogy Hockey helps kick off the calendar year with some premium pulls and, of course, those popular Rookie Premieres cards. Joining three autograph or relic cards per hobby box are five numbered cards. Trilogy may change a little from year to year, but the main draw normally deals with the many first-year cards to be found, and that is still the case for '17-18. Leading the way for UD Trilogy with 50 base cards, the veteran players are treated to a few limited parallels, as well. Options consist of Blue Rainbow (#/999), Green Rainbow Jersey Relics and Black Rainbow Prime Material Relics. Both of the relic editions are numbered. 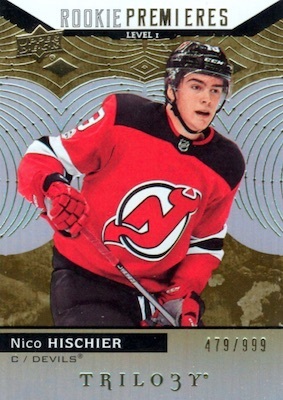 Next up, focusing on 33 of the key prospect names from the NHL, the 2017-18 Upper Deck Trilogy Hockey checklist features three different groupings in the Rookie Premieres subsets. The true base RC is found in the Common Rookies (#/999), and joined by Uncommon Rookies (#/149) and Rare Rookies (#/25). 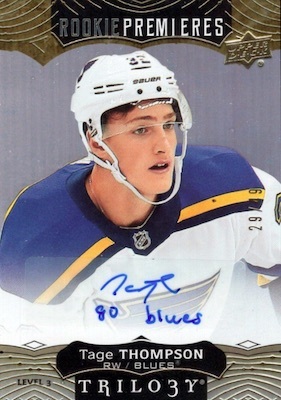 There are also tiered Uncommon Rookies Autograph (#/349 or less) cards, and the more elusive Rare Rookies Autograph cards, which are inscribed and numbered to 49 copies. Proving rookies in three are thrice as nice, the Triple Rookie Autograph set is limited to 25 copies. In addition, low-numbered Black parallels cover most of the subsets mentioned above. Working in a memorabilia element, Green Rainbow foil relic parallels add to the Rookie Premieres lineup with Common Rookies Jersey (#/399), Uncommon Rookies Patch (#/35) and Rare Rookies Tag (#/5). 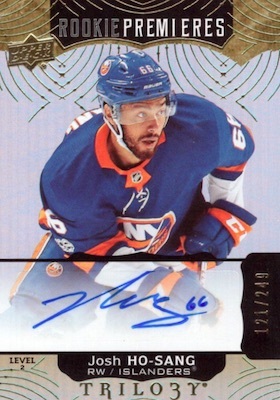 Mixing autographs and relics in a striking manner, 2017-18 Upper Deck Trilogy also visits the hockey stars from multiple eras. 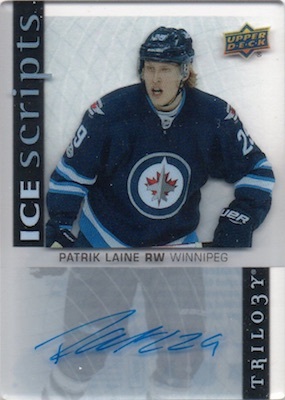 Taking a special interest in plexiglass is a trio of signed inserts: Ice Scripts (1:85 packs), Personal Script (1:500 packs) and Scripted Hall of Fame Plaques (#/25). A staple of Trilogy, the well-known Tryptichs line returns with numbered Tryptichs Relics Jersey and Tryptichs Premium Memorabilia cards containing a large selection of gear, plus Tryptichs Signatures. Collectors can also look forward to numbered Triple Relics and Honorary Triple Swatches cards. 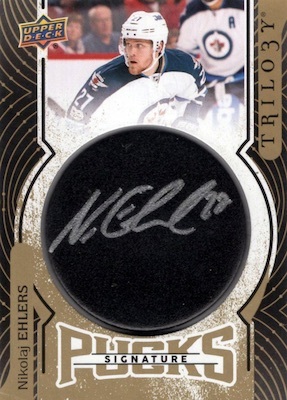 Another familiar face within the brand, the Signature Pucks insert receives wide coverage with themed choices. 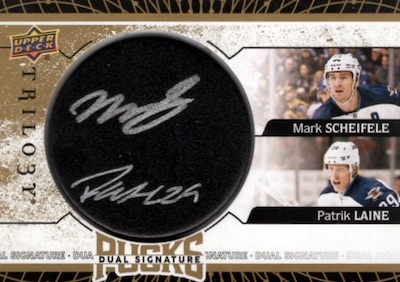 Mimicking the look of an autographed puck, the base Signature Pucks cards average 1:18 packs. There are also Combo, Hall of Fame, Stanley Cup Championship, and Trophy Winners versions, each at odds of 1:560 packs. 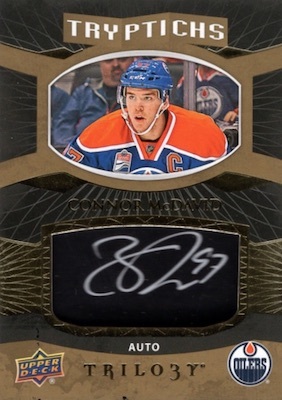 The limited parallels include Team Logo (#/18 or less) and NHL Shield Logo (#/3 or less). 17-18 Upper Deck Trilogy 16 21 Colin White Rookie Premieres WOW!!! 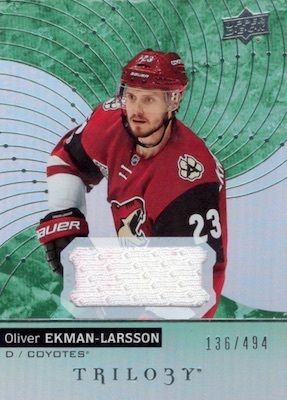 Shop current 2017-18 Trilogy NHL card listings on eBay. PARALLEL CARDS: Blue Foil #/999, Printing Plates #/4. PARALLEL CARDS: Black Foil #/99. 30 cards. Shop rookie autographs on eBay. 32 cards, including 1 triple. Shop rookie autographs on eBay. PARALLEL CARDS: Black Foil #/3 (Card #150 - 1/1**). 44 cards. Shop signature pucks on eBay. PARALLEL CARDS: Team Logo #/18, Shield Logo #/3. 7 cards. Shop signature pucks on eBay. 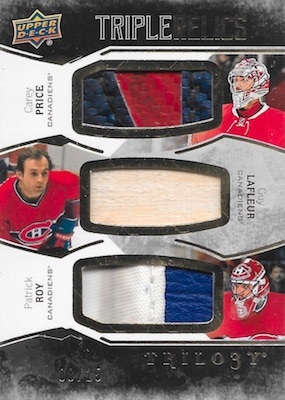 PARALLEL CARDS: Team Logo #/10, HOF Logo #/3 (No Johnny Bower*). 5 cards. Shop signature pucks on eBay. PARALLEL CARDS: Team Logo #/8, Shield Logo #/2. 3 cards. Shop signature pucks on eBay. PARALLEL CARDS: Team Logo #/5, Shield Logo 1/1 (No #SK*) . Cards are noted below to indicate autographs or relics. Overall 16-17 Ice Script 1:218. Yet another watered down product by UD…$120 a box?? No Nico, no Patrick…even the vets aren’t great and they are insane odds. I see this dropping to half the price in a month. We only opened 2 boxes so far but had some excellent hits. I would have probably gone 3.5 here had it been an option. I’m not a fan of the base cards and there’s no reason this should be more expensive than Artifacts. Still, our hits were nice and we’ll buy a couple more boxes. Trey, number 48 in the base checklist is not Bonino, but Eichel. 2.75 stars for me. I really don’t understand why they reduced the base set to only 50 cards. It’s a huge con for this product. 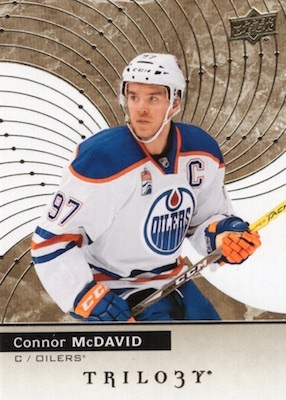 Also, there are only active players in there and at the end you have Gretzky…Anyhow, the design is nice. 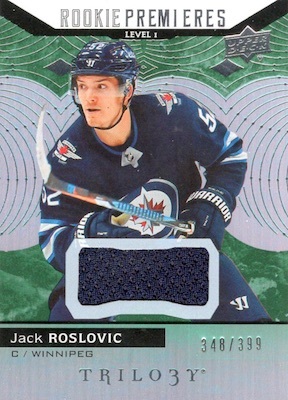 There’s not much innovation in this product though: blue and green parallels, pucks autos, ice scripts, and tryptichs. It’s the same thing every year; it’s not necessarily a bad thing, but some innovation would be welcomed. As for the value, given the rookie crop, there’s not much in there, especially that the rookies are numbered out of 999. All in all, a normal mid-end product. Not spectacular, not a disaster either. Been in a few case breaks. Can’t believe Upper Deck were stupid enough to put Pierre-Luc Dubois auto stickers on Charlie McAvoy cards and vice-versa. Reading “Go Jackets” on a Bruins card makes no sense, or “Go Bruins” on a CBJ card. I was starting to get over there being 90 percent base parallels /999, then the McAvoy and Dubois autos on their level 3 rookies were flipped. Upper Decks quaility control really is top of class.